The beauty of Lake Macquarie is days spent exploring and discovering and discovering your favourite places around the Lake. There's so much to love about our beaches, Lake and mountains, so why not start here, with the top 20 popular destination highlights? A historic mining village and picturesque beach, great for swimming, surfing and snorkeling. A superb pocket of coastal bushland, hike to scenic lookouts and admire stunning ocean views. Explore the sea caves and rock pools on a low tide at this popular family beach. Top swimming beach for families protected by a breakwall that offers excellent fishing in Swansea Channel. One of the area's most beloved picnic spots, features shady grassed expanses, BBQ's, a playground and jetty for fishing. Cycle or walk this restored heritage railway corridor and take in numerous different landscapes along the way. The place to watch the sunset. Have a meal and a drink at one fo the waterfront sailing clubs or picnic in the park. Beautiful bushland reserve. Enjoy extensive lake views from the easy walking trails. Known for its photogenic red rocky headland and iconic shark tower. Redhead Beach is great for families and surfing. The largest shopping centre in the Hunter Region, complete with plenty of dining and entertainment options. A lively lakeside town with boutique shopping, a huge range of eateries and foreshore area popular for picnics and post-meal strolls. Don't miss the nearby Redbluff Boardwalk, an elevated path built out over the lake. The city's flagship park, boasting the 'Best Play Space in Australia', the Lake Macquarie Variety Playground. Set on extensive leafy grounds, browse the gallery's impressive collection of travelling and static exhibitions. Dine out with the lake as a backdrop, admire the boats at the local marina or jump onboard a cruise from the Toronto jetty. Formerly home to the largest seaplane base in the southern hemisphere during WWII, nowadays a serene spot to relax. A peaceful lakeside village home to Dobell House, the former residence and studio of renowned Australian artist Sir William Dobell. 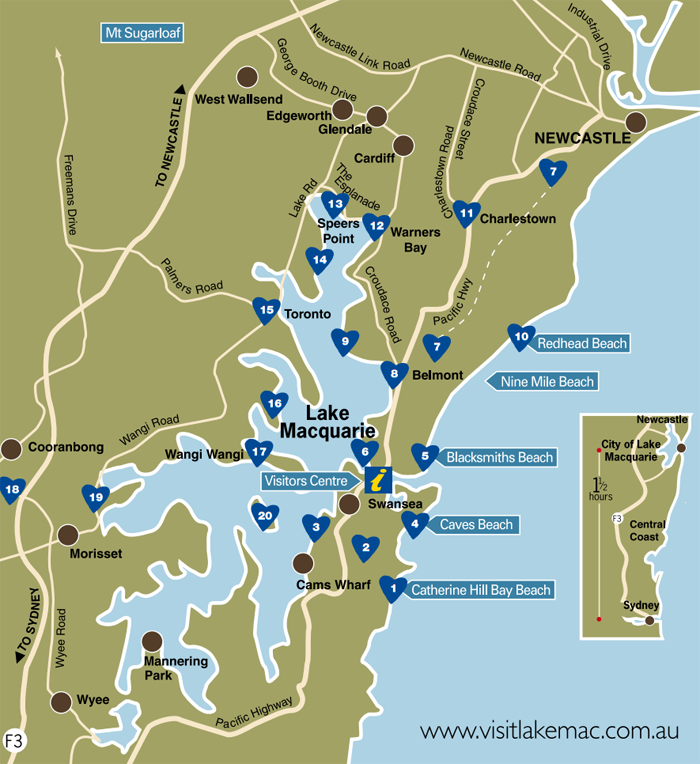 One of the best natural escapes in Lake Macquarie. Walking trails, picnic areas, lookouts, campgrounds and more. Tranquil waterway perfect for kayaking, or have a picnic and feed the ducks from the riverbanks. Hire a boat, pack some lunch and make a day of exploring the Lake's largest island.